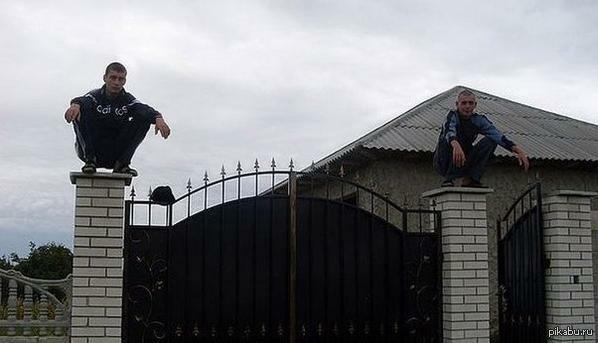 “Russian Gargoyles”. Squatting seems to be popular with Gopota. Gopnik is a pejorative term to describe a particular subculture in Russia, Eastern Europe, former Soviet republics, and other Slavic countries to refer aggressive young men or women of lower-class suburbans (usually under 25 years of age) coming from families of poor education and income, somewhat similar to American white trash, British chavs, Australian bogans and Scottish neds. “In physics we say a system is in a critical state when it is ripe for a phase transition. Consider water turning into ice, or a cloud that is pregnant with rain. Both of these are examples of physical systems in a critical state. The dynamics of criticality, however, are not very intuitive. Consider the abruptness of freezing water. For an outside observer, there is no difference between cold water and water that is just about to freeze. This is because water that is just about to freeze is still liquid. Yet, microscopically, cold water and water that is about to freeze are not the same. When close to freezing, water is populated by gazillions of tiny ice crystals, crystals that are so small that water remains liquid. But this is water in a critical state, a state in which any additional freezing will result in these crystals touching each other, generating the solid mesh we know as ice. Yet, the ice crystals that formed during the transition are infinitesimal. They are just the last straw. So, freezing cannot be considered the result of these last crystals. They only represent the instability needed to trigger the transition; the real cause of the transition is the criticality of the state. But why should anyone outside statistical physics care about criticality? The reason is that history is full of individual narratives that maybe should be interpreted in terms of critical phenomena. “Here is the essence of the theory: durable social regulation evolves when it is demanded by both of two distinctly different groups. “Baptists” point to the moral high ground and give vital and vocal endorsement of laudable public benefits promised by a desired regulation. Baptists flourish when their moral message forms a visible foundation for political action. “Bootleggers” are much less visible but no less vital. Bootleggers, who expect to profit from the very regulatory restrictions desired by Baptists, grease the political machinery with some of their expected proceeds. They are simply in it for the money.” – From “Bootleggers & Baptists: How Economic Forces and Moral Persuasion Interact to Shape Regulatory Politics” by Adam Smith and Bruce Yandel (2014-09-07). (Kindle Locations 50-55). Cato Institute. Kindle Edition. In many domains, particularly community relations, we see the unelected “community leaders” speak on behalf of entire communities, engaging in grievance mongering and exaggeration of issues so as directly profit and accrue power. These baptists preach a moral fable of oppression in order to profit as bootleggers.